Currently the NJDEP is trying to weaken Highlands Act protections by increasing the septic density in the Preservation Area that will reduce the minimum acreage required for new developments by as much as 400%. 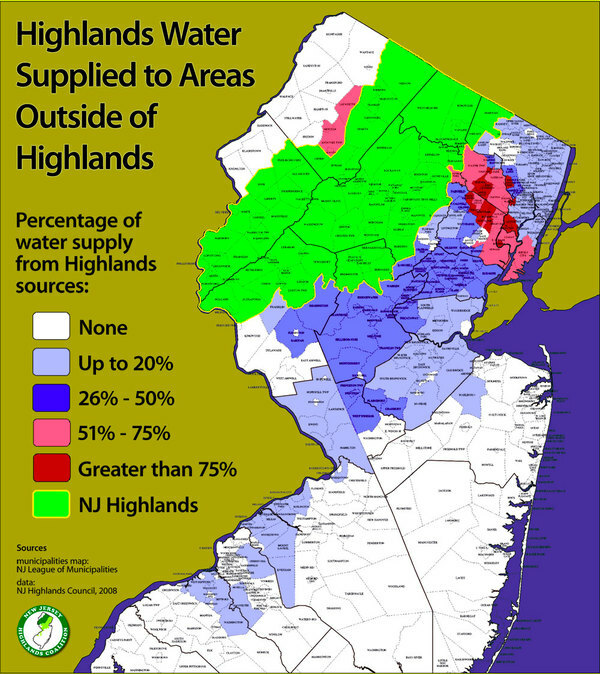 NJDEP denied the request that we, 24 other organizations and Senator Bob Smith made for additional public hearings and to include locations outside of the Highland's region. 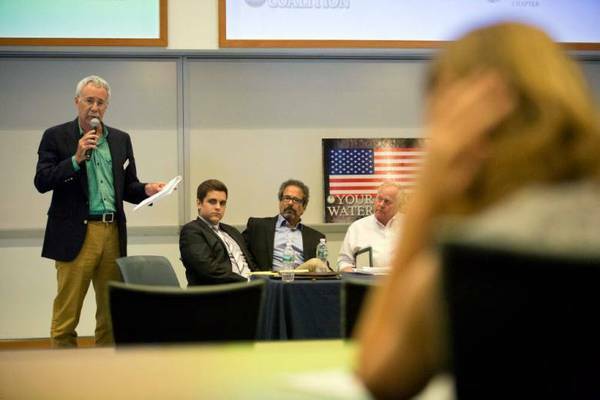 Due to the statewide significance of Highlands clean water the NJ Highlands Coalition in partnership with NJCF, ANJEC,NJLCV, Raritan Headwaters Assn, NJ Sierra and Clean Water Action hosted an independent public comment hearing at Montclair State University on Monday, July 11th. The hearing was moderated by Assemblyman John McKeon, our strongest legislative champion. The hearing was held at the brand new Center for Environmental and Life Sciences where participants enjoyed breathtaking views of the New York City skyline while learning about this important policy issue with state of the art presentation facilities. 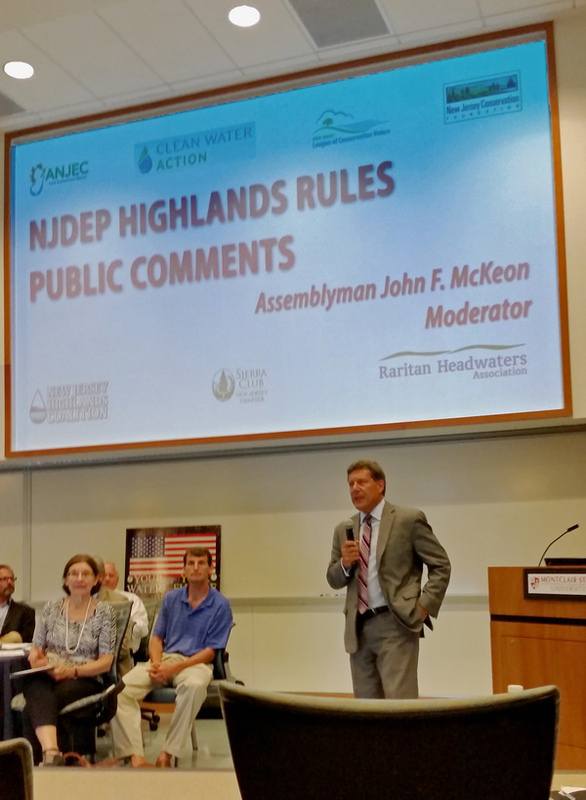 A large number of oral comments were recorded, transcribed and submitted to the NJDEP in time for the July 15 public comments deadline. Additionally, over 1,000 comments/signatures of concerned NJ citizens were collected on a web portal hosted by Jersey City Mayor Steven Fulop and submitted with our comments to NJDEP. We will wait to see if these rule changes will be adopted by NJDEP, unless the Legislature acts successfully in their resolution to block the proposal from being adopted. Our Hopped Up Asbury Park Pub Crawl! 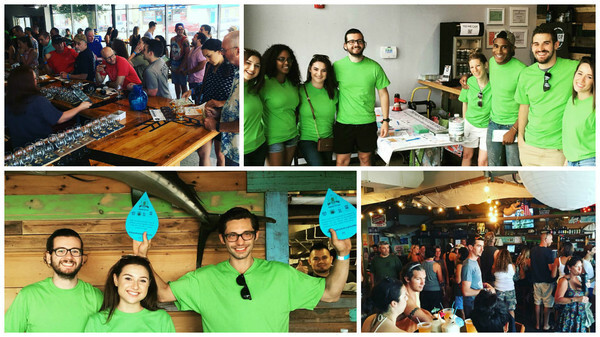 The NJ Highlands Coalition partnered up with the Pineland's Preservation Alliance last Saturday July 16th, for the first ever Hopped Up Asbury Park Pub Crawl. Crawlers enjoyed craft beer, food and other drinks, beachside at four different Asbury Park venues including Dark City Brewery, Langosta Lounge, Asbury Yacht Club and The Asbury Hotel. Despite the late day thunderstorms, great times were had including our Instagram photo contests where participants competed for fun prizes for various categories (check out some of the winners on Instagram by searching #HoppedUpAsburyParkNJ). Pub crawlers also had the chance to sign our Clean Water Pledge Banner, to show support for the clean water, that creates the great beer by the many craft breweries of NJ. We look forward to many more pub crawls like this one, to spread the word about clean water and great craft beer! Mark your calendars for our next Hopped Up Pub Crawl in Morristown, NJ on Saturday, October 22, 2016! On Thursday, June 30th, Governor Chris Christie signed the new open space bill, S2456 into law! This is the culmination of the efforts of so many individuals, organizations, and our legislative champions, and is a very proud milestone for the New Jersey Highlands Coalition and for open space preservation in NJ. Please take in the joy of this amazing accomplishment — and we thank you for everything you have done to help make this happen. Open space, farmland, and historic preservation programs are once again funded starting July 1, 2016, day one of the new fiscal year! Flood Hazard Protection Rules and NJ's Clean Water are Still in Danger! NJ Highlands Coalition strongly supports the Legislature’s action by concurrent resolution to block Governor Christie’s NJDEP from rolling back the Flood Hazard Area Protection rules that protect our waterways and our communities from the devastating worsening impacts of flooding. The Highlands Council will meet this Thursday with the Chester Borough plan conformance consideration of resolution and Fiscal Impact Assessment - Phase III on the agenda. Uphold the Highlands Campaign Outreach Director, George Stafford, continues to introduce the 'Resolution of Continuing Support for the Goals and Purposes of the 2004 Highlands Water Protection and Planning Act' in communities that depend on water from the Highlands. George has been successful in his attempts to recruit municipalities that depend on water from the Highlands and help them understand the importance of protecting this essential resource. So far, nearly 100 resolutions in support of the Highlands have been passed! This is a networking effort. If you have any news or ideas regarding actions such as these in the Highlands that might aid our efforts, contact George Stafford at (george@njhighlandscoalition.org). Even more helpful is if you will introduce George to any personal political contacts. He has been having great success, but we have a long way to go and we need your help!